As of November 1, 2018 – onboard credit earned when booking a Non-Refundable Deposit fare six months or more prior to sailing will no longer apply. 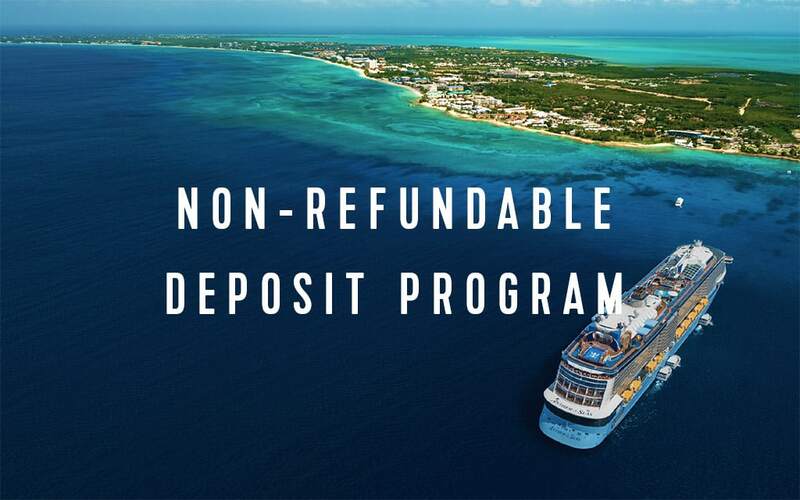 Royal Caribbean is committed to your success — and rest assured that the Non-Refundable Deposit Program continues to offer the best pricing available and will now be available through final payment. A booking made under the non-refundable deposit cruise fare rate (an “NRD Booking”) requires the payment of a non-refundable deposit at the time of booking. The deposit is not refundable at any time after it has been paid. Payment of full deposit and full name are required for each guest at the time of booking. Deposit made toward Guarantees and Grand Suites and higher categories are non-refundable and subject to NRD Booking terms. If the guest cancels an NRD Booking prior to the final payment due date, the cancellation terms of the cruise ticket contract apply, and Royal Caribbean will issue a future cruise credit in the amount of the deposit paid minus a $100USD per person service fee to the guest named on the cancelled NRD Booking (the “FCC”). The FCC is applicable only towards the purchase of a Royal Caribbean cruise and expires 12-months after the issue date (the “Expiration Date”). Any amount remaining after the Expiration Date will be void and forfeited. The FCC is non-transferable, non-refundable, and not redeemable for any other form of compensation, credit, or cash. For NRD Bookings that require a deposit of $100USD or less, no FCC or any other compensation or credit of any kind will be issued. Each time the guest changes the ship or sail date of an NRD Booking prior to the final payment due date, payments made towards the NRD Booking will be applied to the balance of the modified booking and a $100USD per person service fee will be charged to the modified booking. Offer available to residents of United States and Canada. Prices are subject to availability, subject to change without notice; capacity controlled, and may be withdrawn at any time. Royal Caribbean reserves the right to correct any errors, inaccuracies or omissions and to change or update fares, fees and surcharges at any time without prior notice. ©2018 Royal Caribbean Cruises Ltd. Ships registry: Bahamas.